Synthetic peptide corresponding to Human EDG2/LPA-1 aa 342-359. For western blot, Mouse liver, A549 cell lysate, Rat Liver lysate. Our Abpromise guarantee covers the use of ab23698 in the following tested applications. WB Use a concentration of 2 - 5 µg/ml. Detects a band of approximately 43 kDa (predicted molecular weight: 41 kDa). ICC Use a concentration of 8 µg/ml. Receptor for lysophosphatidic acid (LPA), a mediator of diverse cellular activities. Seems to be coupled to the G(i)/G(o), G(12)/G(13), and G(q) families of heteromeric G proteins. Stimulates phospholipase C (PLC) activity in a manner that is dependent on RALA activation. Expressed in many adult organs, including brain, heart, colon, small intestine, placenta, prostate, ovary, pancreas, testes, spleen, skeletal muscle, and kidney. Little or no expression in liver, lung, thymus, or peripheral blood leukocytes. Cell surface. Cell membrane. Prior to LPA treatment found predominantly at the cell surface but in the presence of LPA co-localizes with RALA in the endocytic vesicles. ab123698 staining EDG2 / LPA-1 in Mouse brain tissue sections by Immunohistochemistry (PFA perfusion fixed frozen sections). Tissue samples were fixed by perfusion with paraformaldehyde, cut into 20 micron slices, permeablized with 0.1% Triton-X, blocked with 8% serum for 60 minutes at 35°C and antigen retrieval was by heat mediation in citrate buffer. The sample was incubated with primary antibody (1/50 in PBS) at 4°C for 18 hours. An Alexa Fluor® 555-conjugated Goat anti-rabbit polyclonal (1/1000) was used as the secondary antibody. Publishing research using ab23698? Please let us know so that we can cite the reference in this datasheet. 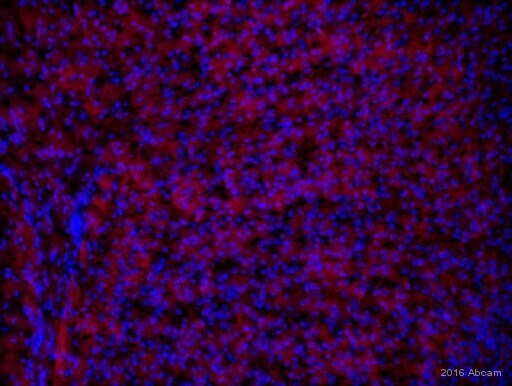 I have successfully used the abcam anti-EDG2 rabbit polyclonal antibody (ab23698) in mouse and human tissue sections. I am wondering if this antibody is very specific for EDG2 (LPAR1) or if it is possible that it may also detect EDG4 (LPAR2) in my tissue samples. The antibody is specific for EDG2(LPAR1). We do not find any significant similarity of the peptide antigen used for LPAR1 antibody production to residues within the LPAR2 protein. The antibody should not detect EDG4 (LPAR2). I hope this is helpful. Please feel free to contact me with any further technical questions.